Bowls... they hold all manner of good stuff, right? Soup and chili and stew. Popcorn and chips. Fruit and pudding and ice cream. Candies. And if you're an animal, doggie food, kitty chow or bird seed. I call all that good stuff 'bowl food', and humankind and animal alike love bowl food! Bowls have been around as long as mankind has been willing to stay in one place long enough to create them, but Wikipedia says that the oldest one found is 18,000 years old. And that's only the oldest one found! The very first material was likely wood, but man is inventive and probably quickly found natural clay easy to mold into all manner of bowls. But enough of the history lesson. I just love bowls (among many, many other things) and collect them; there is so much variety from the rainbow of colors available in Pyrex, to the gorgeous pattens of china and to the durable beauty of Depression glass. 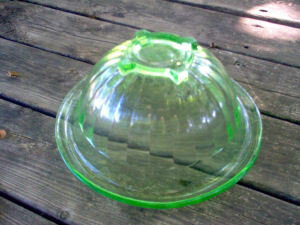 Typically, Depression glass is patterned with grooves or more ornate designs. It wasn't worth a whole lot when it was made, during the Great Depression of the nineteen-thirties, but now... well, it has become extremely collectible! I ran across this unique Depression glass bowl, though, that had me puzzled for a while. It's thick glass with a curled lip and deep grooves down it, with a square base. And it's heavy! You would most definitely would NOT want to have that crash down on your head. LOL!! At first when I found it, I thought that the square base must have been made to fit into something, like a mixer, but it appears that that is not true. After some detective work I think that it is just a design element. I do love the bowl, but it is plain and clear. I've heard that they come in an assortment of colors, like this smaller green one I found at a thrift store for a couple of dollars. I may hunt down one in every color: amethyst, pink, amber... I do adore colored glass! So... have you ever had to do detective work to figure out any of your antique or vintage items? I actually enjoy the research so much it's not 'work' at all! There are many kitchen utensils that took me a while to figure out, but that's for another day. Right now I will treasure my bowls and keep on the lookout for more, one in every color, please! 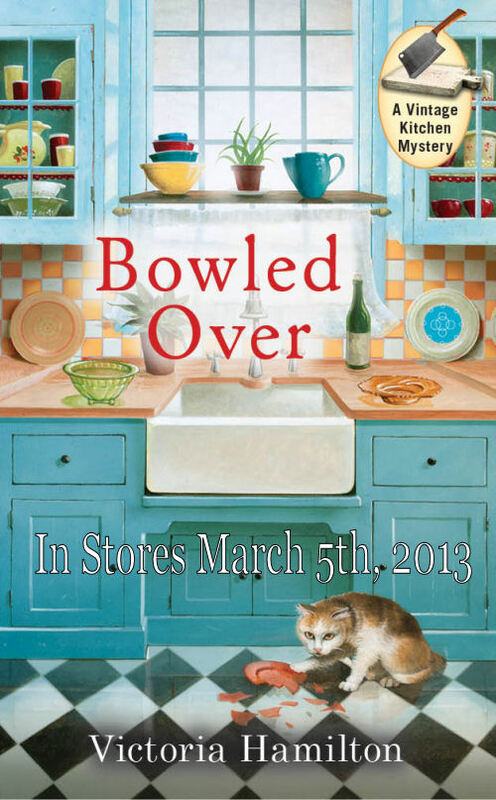 Book 2 of the Vintage Kitchen Mystery Series Bowled Over, will be in stores March 5th, 2013, and is available for pre-order now! Notice the wonderful artwork on the cover, and the artist's depiction of my actual green bowl!! I love that touch. I agree with you--love the cover, especially that green glass bowl! Love the cover!! Read the first one and really enjoyed it and have preordered the second one. I love vintage kitchen stuff. I found a lovely bowl at a yard sale years ago. I still have it in my china cabinet. I was thrilled to pieces when the artist used a photo of my green bowl to paint the one on the cover!! So I'm two for two, because they used my Hoosier-style cabinet as the model for the one on the cover of A Deadly Grind!! Cover is fantastic! I'll be reading it on March 5th. Oh, Lexie, if only I had the room to collect all the bowls I love! 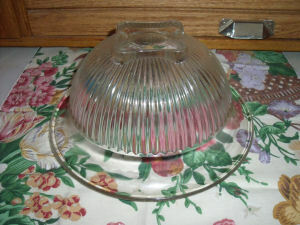 I adore the pink and turquoise Pyrex bowls and the casserole dishes, too. I also love the Pyrex 'Snowflake' special edition bowls. Do you have any of those? I love how your green bowl made it onto the cover. Thank you all!! I am so excited about March 5th I can't wait!! I love Pyrex. 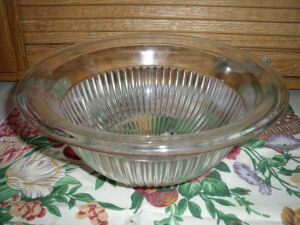 I'm not a collector of vintage Pyrex, but I probably have some pieces that qualify. I ditched all those crummy plastic food savers a few years ago and went back to Pyrex. Love it. So nice and clean and durable. Maybe I should start collecting bowls! Hi Jaymie, I will enjoy reading about your new finds in the next book (already pre-ordered). I have no clue what Pyrex is though. But I do like the pictures you posted. My own bowls are just plain and practical, do I have some nice serving plates. Hi Aurian!! Nice to see you here. Pyrex Primary Colors bowls are graduated sizes and bright colors. 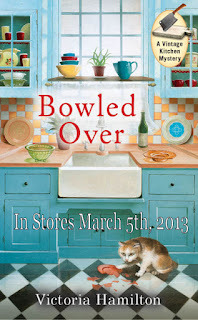 If you look on the Bowled Over cover, my set is pictured on the shelf above the sink to the left! Elaine... that's great! I have that largest one, and I think the green one I have is probably the smallest, though the bases are slightly different.